When things fall from the sky, I want noodles. When it’s rain, the noodles are pho, and, when it’s snow, it’s ramen, but, sometimes, nothing’s falling from the sky at all — it’s just cold and windy, and I want noodles. Marukin is an import from Tokyo, and it’s in one of those fancy food courts — sorry, food halls — trending these days. There’s a sizable queue of people waiting to order at Marukin, and, once I’ve put in my order (tonkotsu shoyu with a small pork curry bowl), I try to find a seat somewhere, moving around twice, first to make room for a couple who sit next to me, second to sit at the main counter alongside the tiny kitchen to have more space for myself. It’s chilly, and coats are bulky, and what can I say? I like having space. Ramen is one of those things I’m maybe oddly specific about. I pretty much only go for Hakata-style ramen because Hakata-style ramen uses tonkotsu broth, a silky broth made by simmering pork bones for eight to twelve hours. It’s fattier than, say, a chicken broth, but the long simmer means you get this rich, creamy broth that’s hearty and comforting. It’s just the thing for snowy days. I like my ramen with thin noodles, thick-cut chashu, a soft-boiled egg, menma, bean sprouts, scallions, and a roasted tomato. Ivan Ramen in New York introduced me to the concept of adding roasted tomato to ramen, and I thought it could be weird at first but maybe not — roasting the tomato first brings out its natural sweetness, which, in turn, pairs so nicely with the salty pork broth, cutting through the heaviness and bringing something fresh and bright to the bowl. The ramen at Marukin is good, exactly what I’m craving on this chilly, windy day in Portland. 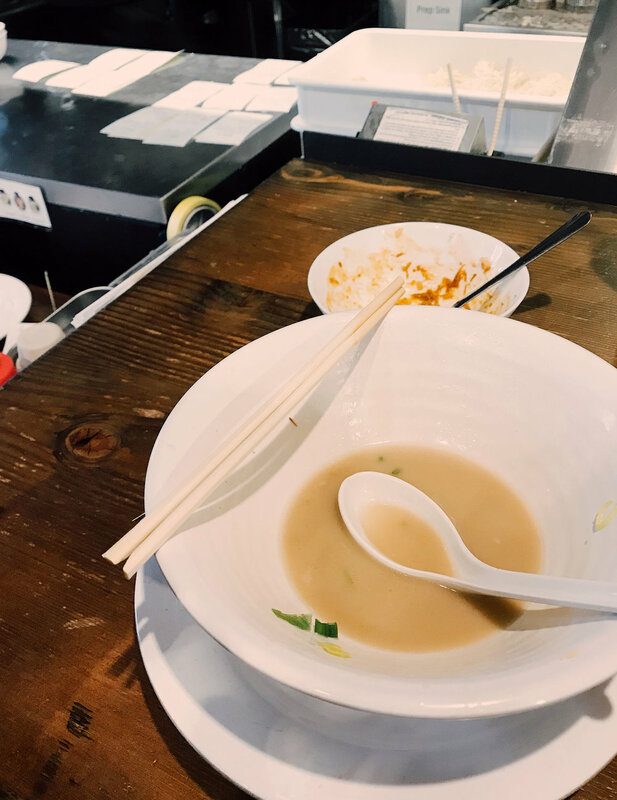 The broth isn’t too heavy or too salty, and the flavors are well-balanced, though I would have preferred thicker chashu slices. The pork curry bowl, though, is only mediocre — they say it’s also slow-cooked, just ground pork in a Japanese curry sauce, but I find it too salty, in need of vegetables or something to undercut the saltiness that is pork and curry together. The rice, too, is oddly really, really wet, on its way to becoming porridge — and maybe this was just a bad choice on my end because tonkotsu ramen is rich and porky as is, and I love curry (it’s one of my five major food groups), but ramen needs cha-han, not curry, to make it a delicious, balanced set.